Laos, the popular backpackers destination in South East Asia, well trodden since the late 90s. A country of mountainous jungles, locals in traditional dress and cities so chilled out you may never want to leave. The country is landlocked, making it slightly more expensive than its neighbours, but it’s still a great place to travel to if you are on a budget. We spent 3 weeks there, covering the 2 main cities Luang Prabang and Vientiane, and then moving onto the hilly countryside in the trekking capital Luang Namtha, the jungles of the Nam Ha National Park, the mountainous Nong Khiaw and Muang Ngoi village. We have put this itinerary together for a 2 week trip, but if you have more time then you can definitely space it out over a 3 week trip like we did. We hope you enjoy our itinerary and let us know if you use it! We would love to hear how it went. It’s likely that your flight will come into Vientiane as it’s the capital of Laos. However, we wouldn’t recommend spending much time there, especially if you are planning to head to Luang Prabang which is a lot more scenic. Vientiane is known as one of the most chilled out and least populated capital cities in Southeast Asia, and that it is, but it’s also pretty unloved, very touristy and we didn’t find it particularly interesting. One of the nicer bits! Get your hostel to book your sleeper bus to Luang Prabang on the evening of day 2 so you arrive in the morning of day 3. Tickets cost around 180,000 kip (£15.50) per person for a VIP bus which is a lot comfier than the regular bus. There's no point in slumming it when you can go VIP for a couple of pounds more! We have written up the bits that we did enjoy in the article below in case you do find yourself mooching round Vientiane…..
Our favourite things were learning to weave in the Houey Hong Vocational Centre For Women, drinking the delicious Laotian coffee, and exploring the city on bikes. There are quite a few markets you can visit, with the most famous one for tourists being set up every evening by the Mekong river. The Mekong River is also known for its stunning sunsets, so make sure you get down there one evening with a beer in hand. We stayed in Ali Backpackers which was perfectly fine, basic and very cheap compared to other hostels. The location was where most of the touristy cafes and bars are situated. It cost 133,000 kip (£11.40) per night with breakfast included. The staff are friendly and can arrange your onward journey but boat or bus. It wasn't the most inspiring of hostels, but a cheap find in the capital. We ate in Phakhao restaurant which specialises in traditional Laotian and Thai food. All dishes were really tasty and actually the stand-out one was a cooked Laotian sausage served with raw garlic, chilli and ginger slices! We would never munch on raw garlic at home but when teamed with sausage it really was a dream. There are loads of French-style bakeries to grab a coffee and fresh croissant in, and we stopped off in Le Banneton which did delicious pastries. For true Laotian coffee, just look out for the condensed milk cans stacked up on the street vendors stalls and you will find yourself a punch-packing cup of sweetened coffee. Take a look at our travel-inspired design shop! Take an overnight sleeper bus from Vientiane to Luang Prabang on day 2 so you arrive in the morning of day 3. The overnight bus takes around 10-12 hours. The journey is pretty tough for those prone to travel sickness, the roads are incredibly windy and we had a driver that was heavy on the accelerator and break pedals. If you opt for the VIP bus then you get your own sleeping chair/pod and it’s 3 people spaced out across the width of the bus. Check out the neon lights on this bus! Have a hostel booked for when you arrive in Luang Prabang so you can head straight there early in the morning. There are lots of tuk tuks outside of the bus station ferrying people into town, but we decided to walk because it was only a few kilometres away from our hostel. Remember to haggle if you choose to catch a ride. Before you leave the bus station, try to book a minibus for the next morning going to Luang Namtha. Luang Prabang is a really popular city with expats and tourists and it’s easy to see why. It’s chilled out vibe and location next to the scenic Mekong river is a clear pull for lots of travellers, and it has something for everyone. Those wanting to enjoy a bucket or two will find lots of cool hang-out bars tucked away in the side streets, and for the more adventurous it’s possible to trek straight into the jungle from the city. Although we thought Luang Prabang had a nice feel to it, we found it very touristy and in places it was difficult to see any local culture because it’s so developed with western-style bars. We would still recommend going though, and it’s a much nicer place to be over it’s ugly sister city Vientiane. For now just spend one night in Luang Prabang because you will be coming back here at the end of the trip. If you weren’t able to book a mini van to Luang Namtha whilst you were at the bus station then get your hostel to book it for you. They will take a bit of a commission but a tuk tuk will be included to get you to the bus station. There are loads of things to do in and around Luang Prabang depending on what your interests are and how much time you have. We were happy not to do much when we were there other than to just soak up the atmosphere and wonder around a bit. You can do jungle trekking from here on organised tours, trips down the Mekong river by kayak or boat, cookery classes, visit numerous exquisite Buddhist temples, mountain biking, a trip over the rickety bamboo bridge, visiting the handicraft night market. You could easily spend a week there exploring what it has to offer and relaxing. There is also the nearby Kuang Si waterfalls which is a lovely trip for a morning or afternoon. The turquoise coloured waters are absolutely stunning and if you bring your costume you can go for a dip! Again your hostel should be able to arrange transport for you, expect to pay around 40,000 kip (£3.40) for a minivan return journey. Entry to the waterfall is an additional 20,000 kip (£1.70). We stayed in ThaViSouk hostel which was ok. The staff are really friendly and helpful, but our dorm room wasn’t the most comfortable because it was baking hot at night. It cost 54,000 kip (£4.65) for a dorm bed per person per night, and that seemed to be the cheapest we could find online, and double rooms in Luang Prabang were generally much more expensive. When we came back to Luang Prabang later on in the trip, we opted to splash out for a few nights over Christmas in a place called Frangipani. This guesthouse is wonderful, the staff are really sweet and the room we stayed in was very pimping with its own balcony and view of the Mekong. This set us back 332,000 kip (£28.50) per night, but that was an inflated price over the festive period. We would 100% recommend staying there! There is honestly hundreds of restaurants and cafes you can eat in, so choosing a good one would not be so difficult. We opted for quite a few meals in local Laotian noodles kitchens, and other outdoor eateries where you can pick up a Thai curry with rice for as little as 25,000 kip (£2.15). At the west end of the night market, there are lots of food stalls selling pre-plated dishes for the bargain price of 10,000 kip (85p) each, and you can choose from fried rice, noodles, spring rolls and also bbq’ed goods on sticks which cost a bit more. There are lots of fresh juice and smoothy stalls for 10,000 kip (85p) a drink, and the Redbull Bar (sports bar) offers 2 draught beers for 15,000 kip (£1.50) which was the cheapest we saw. Our favourite cheap eat however was a Chinese noodle kitchen we found on Khem Khonsu road at the Kitsalat road crossover where you could get a delicious tasting bowl of noodles, meat and fresh vegetables for only 20,000 kip (£1.70). We must say that the Chinese noodles are a lot tastier than the Laotian equivalent! For a bit of a splash out meal, we would recommend the local Riverside BBQ Restaurant on Khem Khong road which is an all you can eat buffet and cook it yourself restaurant. The food was incredibly fresh and you could opt for a whole array of ingredients from fresh prawns to 4 types of mushroom. It was 65,000 kip £5.60 per person which is an amazing price when you think about it! All you can eat BBQ for 65,000 kyat! On the morning of day 4 take a minibus out of Luang Prabang and head for Luang Namtha, the trekking capital of Laos. Again the roads are pretty tough, winding round hills and the surface can be pretty bad. It takes approx 8 hours with a fast driver and costs 130,000 kip (£11.15) when booked through a hostel. Luang Namtha has just one main strip of shops, hotels and tour operators, so when you arrive late afternoon just head to one of the tour operators to look into treks. Luang Namtha itself isn’t anything special, but it is the gateway to jungle treks in the stunning Nam Ha National Park and lots of other outdoorsy activities such as kayaking, zip lining, mountain biking etc. Depending on how many days you want to trek for and what your budget is, you will be able to find a tour that suits you. After doing some research online we heard that you really get what you pay for and it’s not worth going dirt cheap. We chose to do a 3 day tour with Laos Forest Retreat because their reviews were the best on Trip Advisor and we would say from experience that they did deliver. On signing up for the tour, we didn’t know if anyone else would be joining us, but luckily another 3 people signed on and we were ready to go the next morning with 5 people. It cost $105 each for 3 days including everything from food to kayaking, to guides and accommodation. There are definitely tours cheaper than this available with other companies, and the more people that sign up the cheaper it is. A good thing to do is to visit each of the operators and find out what tours people have already signed up for. There are loads of places to stay in Luang Namtha and we would advise just turning up and booking it there and then for the best deal. Prices of rooms can be negotiated down and we managed to get a double room with our own bathroom and aircon for 60,000 kip (£5.15) per night down from the first price of 80,000 kip (£6.85). The best place we found to eat for budget travellers was at the night market, where you can find a bowl of Laotian noodles for 10,000 kip (85p). The eateries at the front closest by the entrance seem to be the most expensive and the cheaper ones are at the back. They also have stalls for bbq’ed banana with coconut inside and crepes, but we found both of them dry and a bit disappointing! The food however on the jungle trek was so amazing, fresh and tasty. It was probably some of the best food we ate in Laos! We opted for a 3 day trek through the national park with a morning of kayaking through one of the rivers. On the morning of day 5, we headed to our tour operators office first thing for breakfast and then they drove us an hour out to start our trek in the national park. Trekking in the jungle is amazing and is very different to all the other treks we have done previously in mountainous regions and countryside. It feels really wild and is a lot of fun! Day 1 one of the tour was mostly trekking and eating some delicious food our guides had prepared. That night we stayed in a homestay at a village in the middle of the jungle and got a glimpse into jungle life. Day 2 of the tour was a morning of kayaking down a river, tackling a few rapids and stopping off at some remote villages along the way. 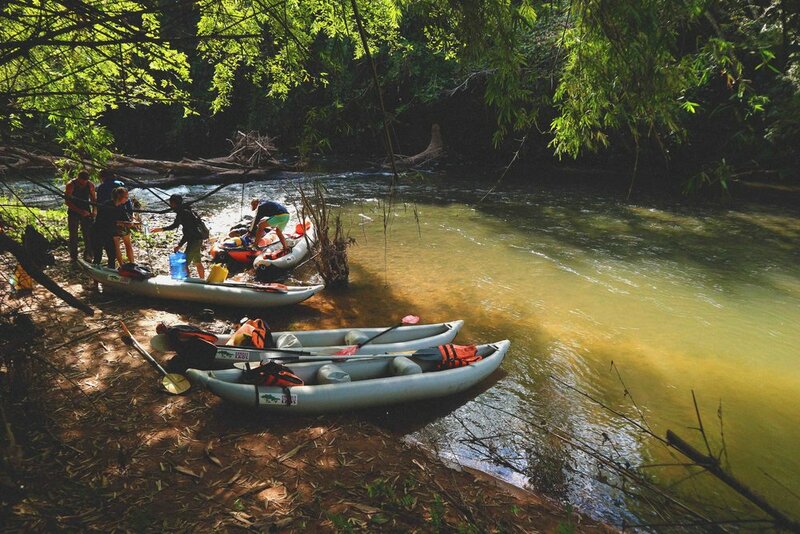 We would thoroughly recommend a bit of kayaking in your tour package. The afternoon was spent trekking up to a viewpoint and then back down to our next village for a nights rest. We watched the guides cook some food on the fire including frogs they had caught from the river! When you get back from the tour, spend one more night in Luang Namtha before heading to Nong Khiaw the next morning. You can book your minibus ticket to Nong Khiaw from one of the tour operators on the high street. It costs around 65,000 kip (£5.60) per person with a transfer to the bus station included. On day 9, take a minibus early to Nong Khiaw which is 6 hours drive away. Nong Khiaw is a beautiful sleepy town set on the Nam Ou River with the backdrop of the lusciously green limestone mountains. It is the perfect place to unwind for a few days, with the option of exploring the area by boat or foot. It doesn’t feel as touristy as Luang Prabang or Vientiane, but there are enough small restaurants and cafes that cater to western tastes. Our personal highlight in Nong Khiaw was climbing up to the 360 degree viewpoint which overlooks the town and landscape. It’s a 40 minute accent if you are fit and used to trekking, and we would highly recommend heading there for sunset. We heard that the steam room and massage place on the way to the viewpoint was good, but unfortunately we didn’t have time to visit, maybe next time! You can also do a trip out by boat to another small town called Muang Ngoi which we will chat about later. There is loads of accommodation in Nong Khiaw and some can be found at very good prices. We would say just turn up and find something there and then. We chose to stay about a ten minute walk from the station in our first guesthouse which was nice because we got a river view bamboo hut overlooking the town on the other side of the water. The hut had its own balcony which caught the afternoon rays. The second place we stayed at was on the other side of the bridge, again close to the water but the view wasn’t quite as good and it didn’t get the afternoon sun. Both rooms cost 60,000 kip (£5.15) per night and were basic bamboo huts with WiFi and a hot shower. You must eat at Delilah’s for breakfast. They have an incredible menu to choose from of pancakes, porridge, cooked breakfasts, baguettes, granola and nearly everything is homemade including the bread. Breakfast range from 20,000 kip (£1.70) to 35,000 kip (£3.00). They also have some very tasty homemade cakes that are served all day till 11pm including apple crumble with coconut ice cream and banoffee pie. For dinner, we would recommend eating at Coco’s, the food is fresh and tasty and the setting is nice. We opted for river weed, river fish and yellow curry all of which were very good, but the stand out dishes were the papaya salad and mango coconut sticky rice for pudding. There is also a tasty Indian restaurant on the other side of the bridge on the left hand side which is worth a visit. Catch the 10.30am boat to Muang Ngoi from Nong Khiaw boat station. The trip takes about 1 hour 20 mins on a local boat and costs 25,000 kip (£2.15). The boat ride isn’t so comfortable, but the views make up for it. Mango Ngoi is a scenic little town further along the river, and is much less developed than Nong Khiaw. There aren’t any cars there, only bikes, and so it’s a very peaceful place to walk around. Again, it’s set against the backdrop of the stunning limestone cliffs, and the dirt roads running through the village make you feel as though you’re stepping back in time. We stayed for only one night here, but really it is probably better to stay for 2, because you only really get a half day to explore the surrounding area. When you awake the next morning, you need to get down to the boat station for 8am sharp to make sure you book your tickets that morning for the return boat to Nong Khiaw. It was really busy at 8am when it opens and you don’t want to risk getting stuck in Muang Ngoi. The boat leaves at 9.30am, and is 1 hour 20 mins back to Nong Khiaw. There are plenty of walks to do from the village. A popular one is to head towards Tham Kang Cave which takes 40 minutes, and then onto a much more remote village called Bana where you will be greeted by smiling locals (a further 30 minutes). The walk takes around 3 hours total there and back with some time spent in the cave and village, so will take up most of the afternoon. There is a viewpoint you can ascend which is a sweaty 1.5 hours up, we didn’t get a chance to do it but we heard it was a stunner. You can also hire bikes to explore more of the surrounding villages, including Bana, Huay Bo and Huay Sen. Muang Ngoi is a quiet village, but there are plenty of restaurants and bars catering to westerners, so if you are happy to relax in a bar for a few hows enjoying the sunshine then you will have a great time here. The locals are a little unfriendly but hey, you can’t have everything! As soon as you get off the boat you will be approached by many locals trying to offer you a room for the night. You can either follow one of them, or you can continue walking straight ahead into town to try and find your own place to stay. We weren’t really that fussed where we were sleeping (as long as it was cheap) so we followed one of the local ladies to Aloune Guesthouse where we stayed in a wooden bungalow for 60,000 kip (£5.15) per night with a river view. You can’t get much better than that! We also read online that if you are after an even cheaper room for the night then if you ask around to the owners of restaurants then sometimes you can bag yourself a double room for 20,000 kip (£1.70). When looking for a room, you just need to find out if they have hot showers, electricity, a mosquito net and wifi if you want it. The Bee Tree Restaurant at the very end of the highstreet does amazing food and cocktails, and every day from 5pm they do a happy hour. The setting is really lovely, they have a cool hang out space in the garden and they get a fire going later on when it gets a bit chilly. We opted for the Laos Laos Sours, which were 2 for 25,000 kip (£2.15), and a few hours down the line we had gotten through 5 each, recorded a Christmas quiz for our friends at home, and had munched on some Laotian curries which went done a bit too well! We wish every town had a Bee Tree restaurant. We also saw a place on the main strip that did wood fired pizzas but it wasn’t open that evening for whatever reason. Breakfast in Riverside Bar and Restaurant was also nice, we opted for a fruit porridge made of rice, pineapple, banana and coconut, and we think condensed milk because it tasted so naughty! We saw there was an all you can eat breakfast for 20,000 kip (£1.83) if you book the night before just on the main strip, but didn’t get a chance to visit. Take the 9.30am boat back to Nong Khiaw which will take around 1 hour 20 mins. Enjoy the last boat ride down the very scenic Nam Ou river, it’s very James Bond in places. If you want to at this point, you can head straight to the bus station and take a minivan or tuk tuk back to Luang Prabang, but we chose to stay another day in the chilled out Nong Khiaw. First thing in the morning, make your way over to the bus station in Nong Khiaw. Your options are to either get a 4 hour ride crammed in a tuk tuk back to Luang Prabang (which sounds like our idea of hell), or to get one of the mini vans which take only 3 hours in much more comfortable seats. The first minivan starts at around 7.30am, and everything gets booked up pretty fast! As soon as a tuk tuk or van gets filled, it will just leave regardless of what time it was scheduled in for. So the last minivan for the day was scheduled in for 1.30pm, but actually it left at 11.30am! Both cost between 40,000/50,000 kip (£3.66-£4.57) and sometimes they may make you pay for empty seats if you want to leave earlier then the scheduled time. Whatever you fancy doing on your last couple of days in Laos you will be able to find it in the chilled out traveller haven of Luang Prabang. It can get really cold in Laos at night times, especially out in the countryside, so make sure you take some warm clothing and maybe a sleeping bag if you tend to get very cold at night. Many nights it was around 3 degrees when we were sleeping in bamboo huts and in the jungle, so make sure you aren’t freezing like we were! Laos is surprisingly the most bombed country in the world and there are still thousands of unexploded land mines scattered across the landscape. It’s not necessarily something to worry about but something that you should be aware of. Just make sure that you always stick to the trekking paths and always go with a local guide. We wouldn’t say that the Laotian food is the tastiest ever but there are plenty of authentic Thai dishes to choose from at tourists restaurants. You can’t go wrong with a Thai curry! If you are looking for somewhere to travel to that is quiet of tourists then this isn’t the place for you. There is such a traveller hub in the cities that sometimes it can be hard to see the local way of life. Although we liked Laos and thought that the countryside was very stunning, we have preferred travelling around other neighbouring countries such as China and Thailand. It sometimes feels as though the Laotian way of life has stopped for the tourists, which is a bit sad. Why not watch our travel video from Laos? Did you like this article? If so then why not Pin It! so you can find it again next time.